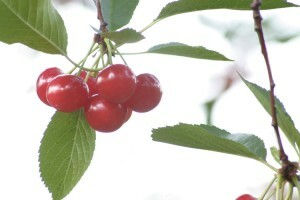 Tart Cherry Juice Can Help Reduce Pain During Running. In a study published May 7, 2010, researchers reported that the juice from tart cherries can help alleviate muscle pain caused by exercise. Endurance sports such as long distance running causes notable muscle damage, which leads to inflammation and fatigue. Most people involved in such activities use NSAIDS (ibuprofen, naproxen, etc.) to reduce or prevent pain, but that carries with it the potential for negative side effects. Tart cherries, rich in antioxidant and anti-inflammatory properties, may have a protective effect to reduce muscle damage and pain during strenuous exercise. In the study, 54 healthy runners part in a randomized, double-blind, palcebo controlled trial by running an average of 26.3 kilometers in a long distance relay race. For each of the 7 days prior to the event, as well as the day of the event, the runners took either 355 milliliters of tart cherry juice or the same volume of a cherry flavored placebo drink, twice a day. Participants were tested to assess their level of pain at baseline, before, and after the race. Of course, both groups reorted increased pain after the race, but the cherry juice group reported a significantly smaller increase in pain compared to the placebo group, and reported a high satisfaction with the pain reductiona that they attributed to the tart cherry drink, as well as increased interest in using the drink in the future. Source: Efficacy of tart cherry juice in reducing muscle pain during running: a randomized controlled trial. Kuehl, Perrier, Elliot, Chestnutt, in the Journal of the International Society of Sports Nutrition. 05/07/2010.